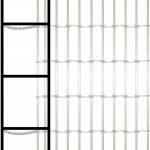 You’ll find the EZ 4-Inch offers a lot of visual appeal and cost saving benefits. It’s perfect for retail spaces, store-within-a-store applications, and offices where a secured area is needed. 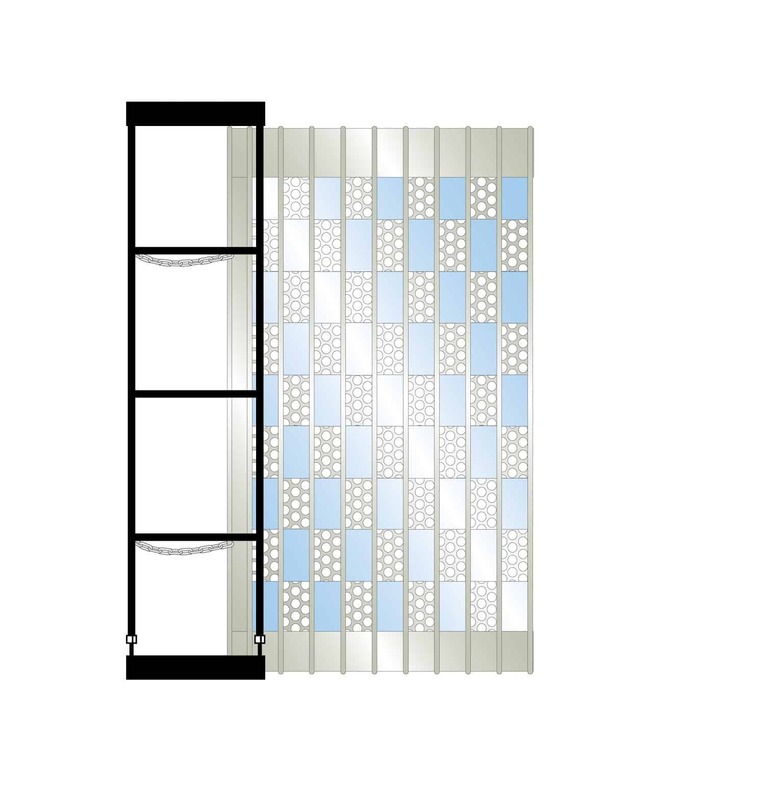 With a 6-inch pocket door, the EZ Series sits flush with commercial wall studs to integrate seamlessly with the overall design of your space. There are also a variety of finishes and grille pattern options that harmonize with any visual scheme. Some options allow even airflow that won’t interfere with building HVAC. The EZ-4-Inch comes with its own pocket, so there’s no need to have your contractor build one. This door is also 90% assembled by the experts in our factory, with the curtain already loaded in the correct order in the pocket. This will save you construction cost and mess, shave time from your schedule, and reduce the risks that come with onsite assembly errors. Ensure your design is usable for everyone with ADA compliant locks and hardware that can be operated by wheelchair users. Easily comply with local fire safety codes with our emergency “door within a door” exits. The veteran problem solvers in our customer support team can help you understand the options better. They can even create easy CAD elements to ensure your designs are completed more quickly. Max Width: 43 ft Single Stack, 86 ft Bi-Parting. Pocket and aluminum pocket door included. Material: 4” wide aluminum rod and link straight pattern. Max Width: 39 ft Single Stack, 78 ft Bi-Parting. 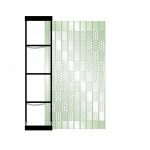 Material: 4” wide interlocked perforated aluminum panels. Material: Polycarbonate panels interlocked in 4” wide aluminum frame. Hinge: 1 piece continuous aluminum. The beauty of the EZ series is that it comes in its own 6” wide pocket and aluminum pocket door to save time and effort in installation. The 6” wide pocket fits between commercial-standard wall studs. As well, the door is pre-assembled and ships in the pocket for the easiest installation of any side folding door. 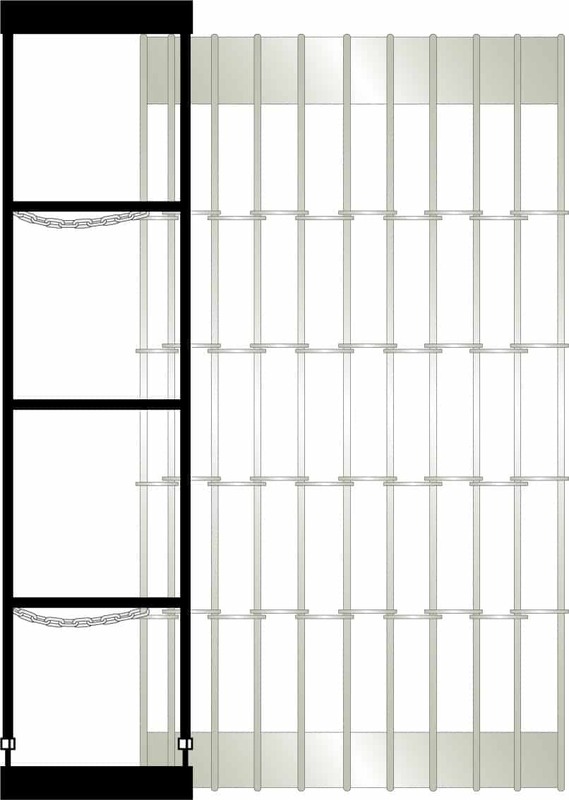 The 1-piece continuous hinge mated with our interlocking panel is a patented design. This hinge stays cleaner during the lifetime of the door – avoid ugly “black soot” commonly found in piano hinges. Sorry, this feature is not available with the EZ Grille model. We can create almost any custom curve in-house thanks to our own bending and heat treating equipment, which means you get the fastest turnaround time possible. We are the industry leader in both quality and delivery time. In stock: clear anodized finish and black anodized finish. All posts can be inverted to accommodate left-handed and right handed users. Handle extends the entire height of the door so that people of all heights, including wheelchair users, can grab and move the door at a height that makes sense. Flush-mounted hardware creates a seamless look and prevents snagging. Incredibly strong and easy to service thanks to unique shape. Dust-proof floor sockets. A spring-loaded cover prevents dirt from accumulating in the socket when the door is not in use. Food safe sockets for counter-height doors. Due to health code requirements, bottom sockets for counter-height security grilles must be food safe. They are constructed of stainless steel and have no bottom, so that food crumbs can drop down to a waste bin below the counter. Easily meet fire code requirements (including ADA rules for wheelchair users) with our “door within a door” fire exit design. Available on request. Update these 1” mortise cylinder locks as needed to work with your existing key system, or to deal with employee turnover. SFIC housing and cores are optionally available. We have models available made of polycarbonate panels, perforated aluminum, aluminum rod and link, and solid aluminum. The EZ works perfectly for the following applications and construction situations.